Thirty-seven years after his coronation, the Alamodu of Ago-Amodu community in Saki East Local Government Area of Oyo State, Oba Oyetola Alao Gbadewolu 1, has been presented with a beaded crown by the Alaafin of Oyo, Oba Lamidi Olayiwola Adeyemi 111. A statement obtained by daily post on Sunday attributed beaded crown delay and presentation of staff to the monarch to vendetta, bickering, animosity, disagreements and disharmony in most parts of the Oke-ogun areas. It added that due to the concerted efforts of the Alaafin of Oyo and whose institution’s principle anchored on fairness, justice, and equity, the State Government eventually endorsed and approved the monarch’s beaded crown and staff of office. 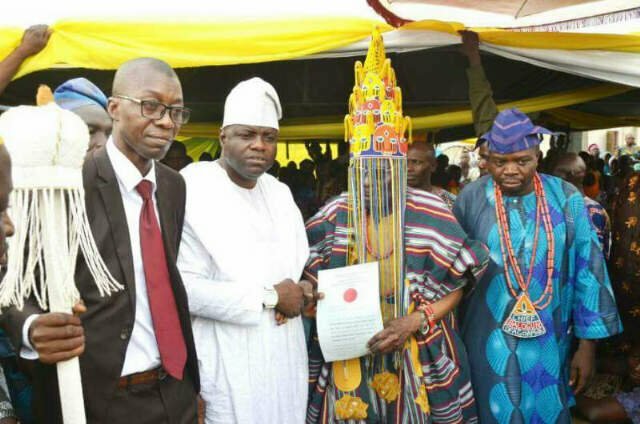 Oba Adeyemi, who is also the Permanent Chairman, Oyo State Council of Obas and Chiefs, recalled in the statement that Ago-Amodu was founded by his grandfather, Oba Adeyemi Alowolodu 1. Indigenes and residents of the community rolled out drums and besieged major streets in the community to celebrate with their ruler, Oba Oyetola Alao Gbadewolu 1, who they referred to as “a visionary and God-fearing monarch”. Shops and offices were under lock and key, as market men and women as well as workers thronged venue of the coronation to be part of remarkable history. Oba Adeyemi, who arrived the community in a long convoy of vehicles comprising Oke-ogun traditional rulers and some members of the Oyo Traditional Council [Oyo Mesi], was received into the community by the elated people who were full of praises for his intervention and honesty of purpose as the Permanent Chairman, Oyo State Council of Obas and Chiefs in the recommendation of their monarch for the wearing of beaded crown. The Alaafin while speaking described beaded crowns as “the most convert paraphernalia of Yoruba Obaship”, saying that beaded crowns are anointed and so should be sparingly used. The crown, he said, incarnates the intuition of royal ancestral force, the revelation of great moral insight in the person of the king, and the glitter of aesthetic experience. According to him, the people must submit themselves, and are absolutely submissive to the authority of the Oba who in turn is expected to rule for the general good and welfare of the community as a whole. ‘’In fact, no ruler or leader in contemporary modern political system has the kind of control and influence possessed by the Oba on the people. “Oba is generally seen, recognized and acknowledged as the custodian of the people’s history and culture. A Yoruba Oba personifies the kingdom and represents the reincarnation of the past ancestors of the community. The words of an Oba were orders and their actions were divine and sacred”. Governor Abiola Ajimobi of the state who spoke through Commissioner for Local Governments and Chieftaincy Matters, Mr. Bimbo Kolade urged the monarch to promote peace and unity among all the people of the community. He also cautioned the monarch against acts that could tarnish his reputation. Ajimobi who lauded traditional rulers, particularly the Alaafin of Oyo for their support for his administration, reiterated the commitment of his administration towards their welfare. Oba Gbadewolu 1 in his speech pledged to dedicate his life to the service of his people, the community and to commit his knowledge, contacts, integrity and all endowments granted him by God to the growth and development of his people and the community. He said: “As the throne is established by righteousness, I pledge to remain fair and just in all dealings for the betterment of all”. 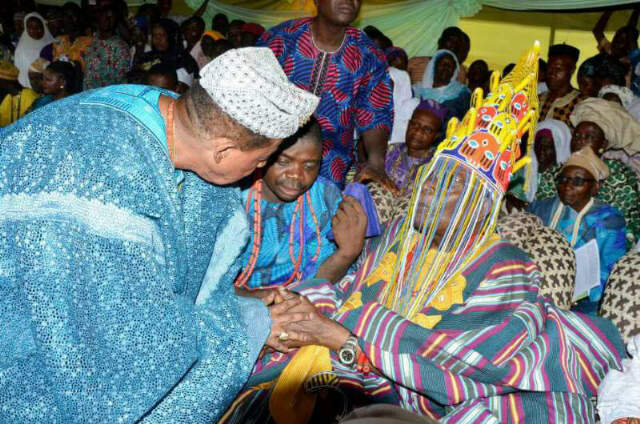 He thanked the Alaafin for what he described as “his unquantified support”. 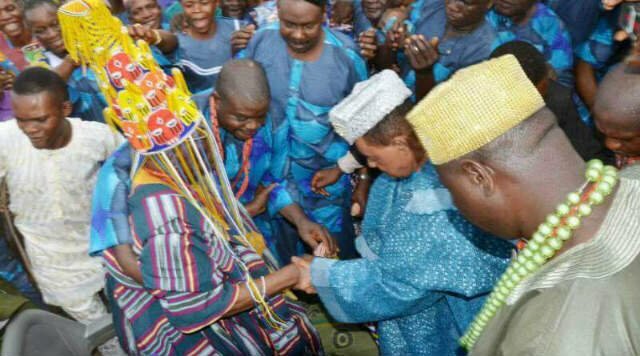 Alaafin wore the ruler with the beaded crown after the performance of some traditional rites. The governor’s representative then presented the staff of office amid jubilation by people of the community.